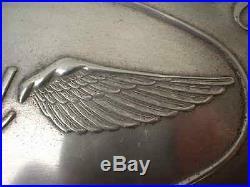 This listing is for an original stamped aluminum oval side medallion from the left front side of a Ford Tri-Motor airplane. Ford bought the Stout Metal Airplane Company in 1925 and built 199 Tri-Motor airplanes starting in 1926. The last of those very innovative all metal airplanes were delivered in 1933. 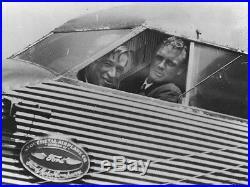 The last photo of this listing shows Charles Lindberg inside a Tri-Motor with Will Rogers behind him. One can plainly see a medallion just like this one in that photo. This gorgeous and highly detailed work of art is in the shape of an oval and measures 14-3/8" long by 9-7/8" high. The perimeter is sort of dimpled so that it can be attached over the corrugated aluminum siding material used on the Tri-Motor. 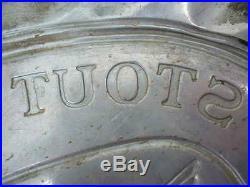 This medallion was stamped from aluminum in matching (male and female) metal dies. As you can see in the second photo of this listing, the letters are just as crisp on the back side as they are on the front side. The level of detail on this medallion is almost unbelievable. 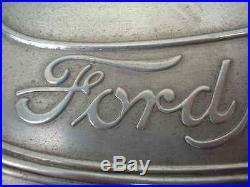 The famous Ford script and all of the lines and letters are very sharp and well defined. 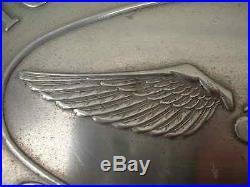 The two wings on both sides of the Ford script even have individual feathers in them. What is almost unbelievable to me is the fact that each feather even has several hundred individual veins clearly shown in great detail. 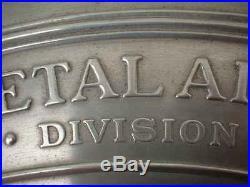 This kind of detail in a metal stamping is very unusual. I have only seen coins with this type of detail displayed on them. I ran across this gem in about 1986 at the Billings Montana antique car swap meet. I bought it from a man there who was not sure about where it came from. He mentioned that the Johnson Flying Service in Missoula Montana used several Tri-Motor planes up into the 1960's to haul smoke jumpers to forest fires. He told me that one of those planes crashed at the airport in Billings some time earlier and that this medallion may be from that very plane. 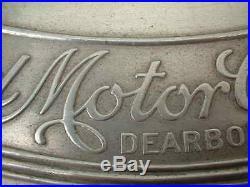 I believe this exquisite piece really belongs on a restored Ford Tri-Motor airplane instead of in my bank safe deposit box. 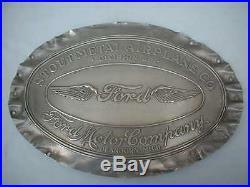 I really like this medallion and do not have to sell it. If this very special part of that plane is not worth 1% to 2% of the value of the airplane to someone other than me, then I will be happy to keep it in my extensive collection of collectible cars, trucks, and tractors. I will be adding more information soon. The following is from Wikipedia and gives part of the interesting history regarding the Tri-Motor and some of it's uses. The Ford Trimotor (also called the "Tri-Motor", and nicknamed "The Tin Goose") was an American three-engined transport aircraft. That was first produced in 1925 by the companies of Henry Ford. And that continued to be produced until June 7, 1933. Throughout its time in production, a total of 199 Ford Trimotors were produced. It was designed for the civil aviation. The story of the Ford Trimotor began with William Bushnell Stout. Who had previously designed several aircraft using principles similar to those of Professor Hugo Junkers. The noted German aircraft designer. In the early 1920s Henry Ford. Along with a group of 19 other investors including his son Edsel. Invested in the Stout Metal Airplane Company. 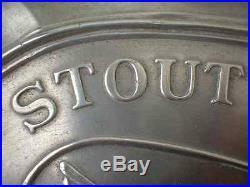 Stout, a bold and imaginative salesman, sent a mimeographed. In 1925, Ford bought Stout and its aircraft designs. The single-engined Stout design was turned into a multi-engined design, the Stout 3-AT. After a prototype was built and test-flown with poor results and a suspicious fire caused the complete destruction of all previous designs, the "4-AT" and "5-AT" emerged. That the Ford Trimotor used an all-metal construction was not a revolutionary concept, but it was certainly more advanced than the standard construction techniques of the 1920s. The aircraft resembled the Fokker F. Trimotor, but unlike the Fokker, the Ford was all-metal, allowing Ford to claim it was the safest airliner around. Its fuselage and wings, following a design pioneered by Junkers. During World War I with the Junkers J. And used postwar in a series of airliners starting with the Junkers F. Low wing monoplane of 1920 of which a number were exported to the US, the Junkers K 16. High wing airliner of 1921, and the Junkers G 24. Trimotor of 1924, all of which were constructed of aluminum alloy. Which was corrugated for added stiffness, although the resulting drag. So similar were the designs that Junkers sued and won when Ford attempted to export an aircraft to Europe. 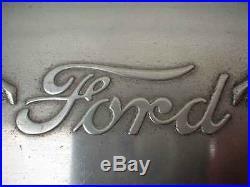 In 1930 Ford countersued in Prague. And despite the possibility of anti-German sentiment, was decisively defeated a second time, with the court finding that Ford had infringed upon Junkers' patents. Although designed primarily for passenger use, the Trimotor could be easily adapted for hauling cargo, since its seats in the fuselage could be removed. To increase cargo capacity, one unusual feature was the provision of "drop-down" cargo holds below the lower inner wing sections of the 5-AT version. Ford Tri-Motor Locator - 18 Known. These are the surviving Ford Tri-Motors at the present time as known. Aircraft are sorted by model and c/n; then follows CAA registration, year of manufacture, first owner, general comments, and present location. 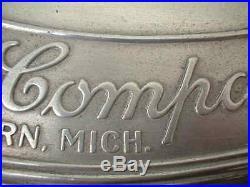 The item "Ford Tri-Motor Airplane Medallion Emblem Sign William Bushnell Stout Metal Co" is in sale since Wednesday, November 19, 2014. 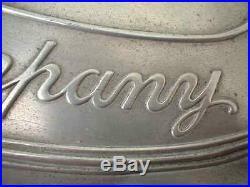 This item is in the category "eBay Motors\Parts & Accessories\Vintage Car & Truck Parts\Exterior\Other". The seller is "toysanyone" and is located in Bozeman, Montana. This item can be shipped worldwide.